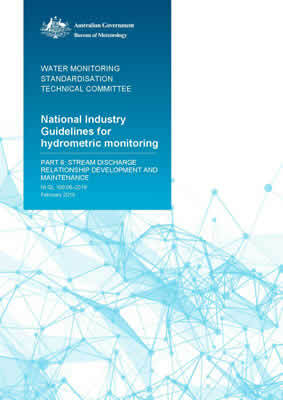 The purpose of this document is to provide guidelines for recommended practice for stream discharge relationship development and maintenance for hydrometric monitoring sites to achieve adequate accuracy for its intended application. Many of the concepts of this guideline can be generally managed through electronic database/software tools, but can equally be maintained through manual records. Open flow channels with artificial flow control structures. This guideline outlines acceptable and common techniques that can be employed in the development and maintenance of stage−discharge relationships but does not restrict the practitioner from utilising other methodologies in accordance with organisational/customer requirements or quality assurance processes.